BURLINGTON, VT - The Fleming Museum of Art is pleased to announce two new exhibitions opening this winter showcasing the miniature in art. Small Worlds: Miniatures in Contemporary Art explores the ways contemporary artists use miniatures to inspire awe, whimsy, and even dread. A related exhibition of miniatures drawn from the Museum’s permanent collection, Global Miniatures, will explore the universal appeal of miniatures found the world over and throughout time. Both exhibitions open on February 13, and will be on view through May 10, 2019. 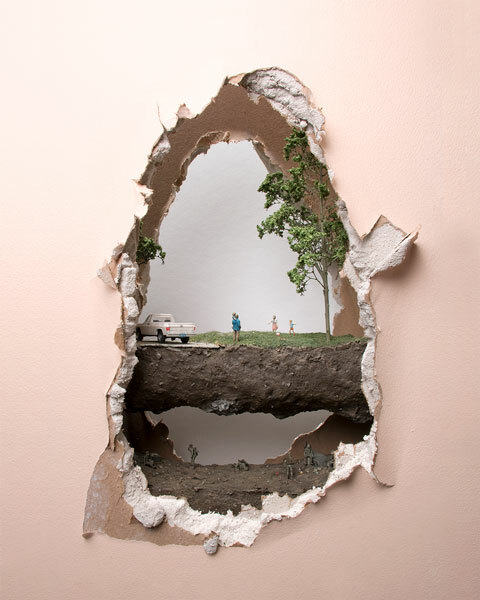 The artists featured in Small Worlds either create or employ found miniature figures, rooms, and landscapes, displaying them through photographs or sculptures. The resulting scenes, reminiscent of our childhood playthings, can recall in us that sense of wonder for the world around us, but also call our attention to the dark forces hidden beneath the seduction of the small. As our inherent attraction to the miniature draws us into the imagined world of the artist, real-world traumas such as violence, displacement, and environmental disaster are brought to our attention in intricate and intimate ways. Joe Fig and Minimiam (Akiko Ida + Pierre Javelle) each communicate the joys of creating. Fig seeks to understand famous artists by constructing obsessively meticulous models of their studios, providing viewers unique access to the creative process. Under the joint name Minimiam, photographers Ida and Javelle merge their love for art and food by arranging miniature train figures with fruit, pastries, and ice cream to create whimsical scenes of recreation, labor, and culture. Sally Curcio and Allison May Kiphuth translate their love of landscape into enchanting capsules. Curcio creates modern renditions of snow globes made from found objects. Some recreate real sites such as New York City’s Central Park, while others become other-worldly fantasies. Kiphuth is inspired by her travels and her New England environment to integrate watercolors into “uncontained dioramas” that communicate her passion for the natural world. Thomas Doyle and Lori Nix + Kathleen Gerber depict the human world eerily overtaken by nature. Doyle constructs models of suburban homes subject to sudden, inexplicable environmental disasters that displace and bewilder their inhabitants. Nix + Gerber create and then photograph intricate scenes of cities and sites of arts and culture reclaimed by natural forces after humans have disappeared. Corin Hewitt and Mohamad Hafez communicate the dark psychological charges evoked by the buildings that constitute “home.” A native Vermonter and descendant of a family of artists, Hewitt has constructed a modified miniature version of his family’s cabin in East Corinth, Vermont, in which outer and inner walls are manipulated to question the distinctions between public and private, inside and outside. Hafez’s heart-wrenching models of Syrian buildings, destroyed by war but displaying signs of life and hope, reflect the artist’s longing for a home transformed by turmoil. Two artists based in Vermont recreate in miniature the museum activities of collection, classification, and display. Brian D. Collier developed The Collier Classification System for Very Small Objects, a taxonomy used to name any solid, non-living thing smaller than 8mm x 8mm x 25mm. Visitors can peruse The Traveling Museum of Very Small Objects and make their own contributions to the collection. Matt Neckers created the Vermont International Museum of Contemporary Art + Design (VTIMoCA+D), a series of galleries—many of them mobile—full of miniature artworks. VTIMoCA+D galleries in antique suitcases and a vintage fridge will be on view. The latter will be rearranged by “guest curators,” including UVM students throughout the run of the show. Across the Marble Court from Small Worlds will be the exhibition Global Miniatures, showcasing miniatures made in diverse cultures and times drawn from the Fleming Museum’s global collection. In many historic cultures including Ancient Egypt and Pre-Columbian Central and South America, miniature objects were included in burials in order to provide service in the afterlife. 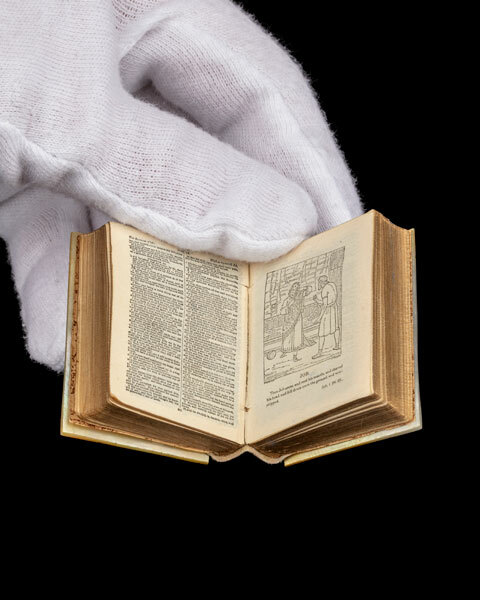 In Europe and America from the 1500s to the 1800s, miniature versions of sacred texts or portraits might be carried on one’s person as a constant reminder of spirituality and family. These objects, despite their small size, were also a display of wealth, due to the laborious production and fine materials that went into creating them. Small things naturally came to be associated with children. Dollhouse furniture and miniature housewares were used to educate girls and boys about their future roles as adults. Miniatures were also used to teach adults in a museum setting, as evidenced by examples from past Fleming Museum displays. This was particularly true in the case of global cultures, whose unfamiliar forms of housing or transport were displayed in dioramas and models. Yet, for westerners, miniatures from foreign lands served more than an educational purpose. As traders and tourists made incursions into Asia, Africa, the Pacific Islands, and the indigenous Americas, artisans in those places increased production of figures, models, and dolls of various kinds, in order to supply a ready market of people seeking decorative souvenirs of their global travels. “Whether conveying the simple joy of a clever visual pun, or exploring some of the greatest challenges facing our world, art in miniature compels us to look closer, in awe at the skill, enchanted by the size, captivated by the message,” says Rosen. An exciting schedule of programs and events accompanies the exhibitions on view at the Museum this winter and spring, including a festive opening reception hosted by University of Vermont President Thomas Sullivan and Fleming Director Janie Cohen on Wednesday, February 13, from 5:30 to 7:00 pm. The University of Vermont’s Fleming Museum of Art serves as a gateway for active cultural exchange and critical thinking and has presented diverse artistic traditions for over 85 years. The Museum is Vermont’s premier public showplace for exhibitions, education, and scholarship about local and world cultures, both historical and contemporary. For more information regarding the Fleming Museum’s exhibitions, programs, and location call (802) 656-0750 or go to the Fleming Museum website at www.flemingmuseum.org. “Whether conveying the simple joy of a clever visual pun, or exploring some of the greatest challenges facing our world, art in miniature compels us to look closer, in awe at the skill, enchanted by the size, captivated by the message,” says Fleming curator Andrea Rosen.